You'll be £16.99 closer to your next £10.00 credit when you purchase Blood, Bilge and Iron Balls. What's this? 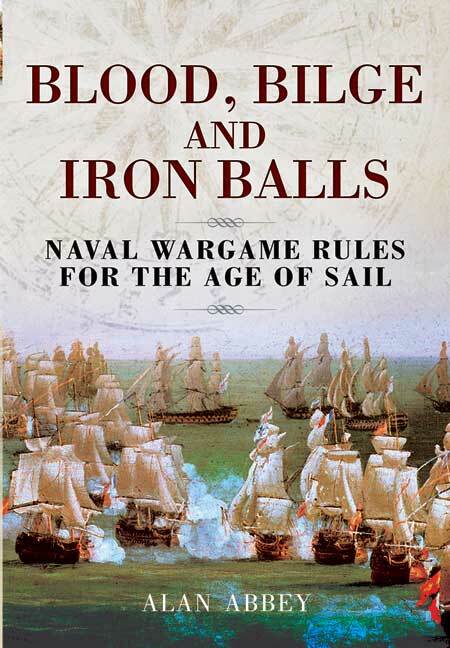 If you are fond of naval battles with sailing boats and would like to get started in the world of naval wargame , "Blood , Bilge and Iron Balls" can be one of your first hand. There is a seven-page section of full-colour cut -outs fleets for the British, French and Spanish. Counters are available to download, along with all of the ship rosters and playing aids, on the Pen and Sword website, in case you don't want to cut up your nice book. These are a good solid set of rules that will appeal to newcomers to the period, especially for their simplicity and support materials. I first came across these rules by accident. I have played a few Napoleonic naval war games and have found some to be rather complicated. However these rules are the opposite, they are fast, tense, exciting and above all fun. So if you have ever had even a passing interest in Napoleonic naval warfare and wondered what it was like to imagine the feel of the quarter deck rolling under your feet, sea spray in your face and the wind in your hair; the roar of round shot as it passes through your ships sails and spars, battling to keep your ship afloat as she sustains critical damage; fires ravaging your decks as you decide which repair crews to direct to each crisis to keep her in the fight, then these are the rules for you. The game turn is divided into three parts, a firing phase, where firing takes place, a sailing phase where you carry out sail changes, turns and movement and a repair phase where you attempt to use your crew to carry out repairs to keep your ship or ships in the fight including putting out fires, repairs to your steering gear and more. These phases are printed on six cards which are shuffled, placed face down and then drawn, giving total unpredictability to each turn. At the end of each turn bloody boarding actions are carried out with the assistance of your Marines. Damage is decided by the turn of playing cards with the jokers providing the odd lucky shot causing disastrous levels of damage to be dealt with. A player can easily control one ship or a whole squadron. When I introduced these rules to my club after a brief explanation it took only a few turns for them to grasp the game and play without guidance. Easy to learn hard to master, all thoroughly enjoyed the game. Apart from dice and playing cards the book provides all the items needed to play or they can be downloaded from this website. There are even coloured ship counters you can use if you donâ€™t have any ships. The book also provides scenarios and a campaign game. A thoroughly enjoyable game which I can heartily recommend. If you only buy one set of Napoleonic naval rules these are the ones. Alan Abbey is a keen wargamer of long standing, and founder of several wargaming clubs. He is currently studying for his MA in history and is also a keen local historian and former chairman of the Historical Research Group of Sittingbourne.